E-commerce websites are now vulnerable to price wars from competitors who want to gain more market share. When a competitor makes an aggressive price move, one of the first steps you should take is to stop the marketing activity of the affected products/services, until you think about how your participation should look like. So, you avoid any wasted spend on price-driven users, who are the majority these days. 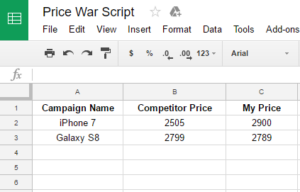 To help you in handling prices wars, we’ve written an AdWords script to pause or enable campaigns based on the price difference between you and your competitors. 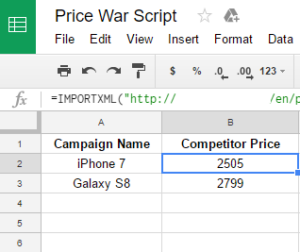 The script is linked to a spreadsheet that contains the competitor prices and your prices. Both prices data are fetched and updated automatically from the website. You don’t have to worry about updating them manually. The script then pauses the campaign if the price difference between your product and competitors’ is greater than a specific threshold you determine. And vice verse, it enables paused campaigns if your prices return to be competitive. Finally, the script sends an email with all the actions have been taken, which campaigns have been paused or enabled. 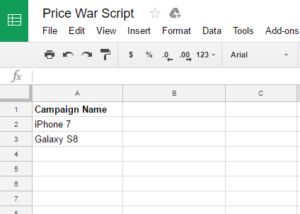 The first step is you add a column in your spreadsheet and name it “Campaign Name” and then include your AdWords campaign names of the relevant products. Let’s say, you have two campaigns, one is promoting the iPhone 7 and another is advertising Galaxy S8. You want to compare your prices to the market prices, and if your prices are 15% higher that the lowest price, you want to pause these products campaigns. Google sheets have a function that allows you to import any content from any website and extract a specific information to your sheet. The formula is IMPORTXML(); You can read more about it here. In our case, we want to import the price of specific products from our competitor’s website (or price comparison websites) to Google sheets. Visit your competitor or the price comparison website and inspect (right click, then select Inspect) the price elements on the product page. This brings up the developer inspection window where we can inspect the HTML element for the price. Then copy the class or id name of the price. The XPath query is to look for an HTML element on the page. In our example, we copied the class name which is “lowPrice”. The output of the formula should return the price on the page. Do the exact step with other products. Add a new column to the sheet next to the “Competitor Price” Column and name it “My Price”. 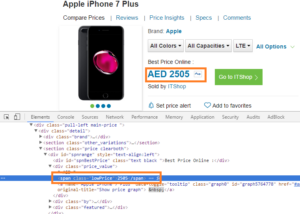 Use the exact formula above IMPORTXML to retrieve the prices from your product pages. Make sure to add the relevant page URL and XPath query. Navigate to your AdWords account and copy the script source below. Make sure to add your spreadsheet URL that contains the prices.Also, change the price threshold based on your needs. Price threshold is the maximum difference between your product prices and competitor prices. In the example below, it’s set to 0.15, this means when my prices are 15% greater than my competitors’ prices, the campaigns will be paused. Finally, add your email address, so you can receive a summary of all modifications happened. var Notify_Me ="Add Your Email here"
Thanks a lot for writing out this killer script. Wanted to check how you would go about tracking for discounts as well? 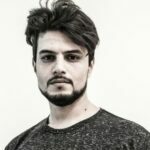 For example, if my competitor uses a different class/id for discount prices, would I have to go in and check manually and update the XML path? You can pull the discount class as well and multiply it to the price class. The result should be the price after discount. Thank you for your script 🙂 How can I do if the website use the same class for several price. For the full price, or lowprice is the same class. So google spreadsheet returns me the first class it reads. A big thank for this amazing post ! Really useful and smart ! I just have a question, how can we do if the page has several same span class. The excel file display the first one, but if I want to display the second, how can I do ?